3-Euphemia Lawson was born on 26 Apr 1849, was christened on 17 Oct 1849 in the Female Factory, Cascades, Hobart, and died as Emma Agnes Cocker on 7 Sep 1921 in Springfield, Tasmania at age 72. As Emma Lawson, Euphemia gave birth to a daughter Amy Louisa on 13 Mar 1872. The father was named as George Jones, labourer, of Breadalbane. This is believed to be Geroge Jones, son of convicts Thomas Jones and Sarah Venable. At this time George Jones' wife, convict descendant Elizabeth Wheeler, was in the late stages of pregnancy with their first child. Amy was adopted and raised as Emma Louisa Cocker. As Emma Agnes Jones, she married Joseph Cocker on 23 Oct 1876 in Church of Christ, Longford, Tasmania. Joseph Cocker was born on 13 Nov 1851 in Hadspen, Tasmania, was christened on 25 Mar 1852 in Patterson Street Church, Launceston, died on 19 Jul 1937 in Launceston General Hospital, Launceston, Tasmania at age 85, and was buried on 21 Jul 1937 in Springfield Cemetery. Like all of the Tasmanian Lawson family, Euphemia had a very difficult start in life. 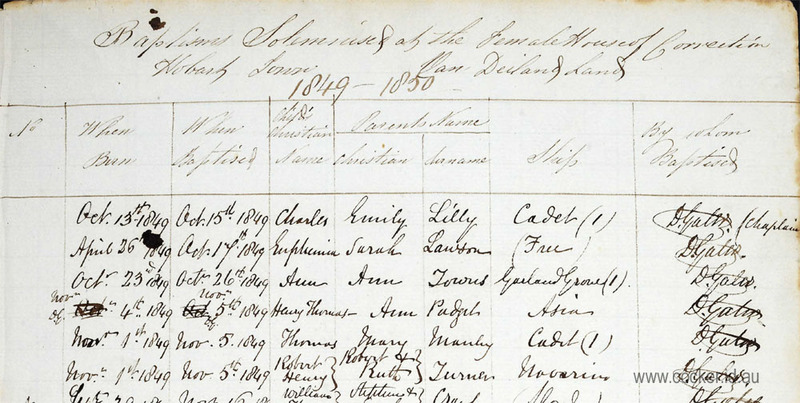 No birth record has been located but she was baptised on 17 Oct 1849 at the Cascades Female House of Correction, when her birth date was given as 16 Apr 1849. As was common practice at the Female Factory, the father's name was not recorded and so it remained unknown until DNA testing revealed it to be George Jones . Her mother, Sarah, does not appear to have been a resident, so presumably the baptism occurred there so that grandmother Euphemia could attend, as she was incarcerated again at that time. Little is known about convict Jacob Standring, although he stayed around long enough to father three brothers and sisters to Euphemia's mother, Sarah. The court and newspaper reports describe a troubled life in which her mother Sarah lost control when she drank. As the oldest, Euphemia would have been used to taking control and taking care of Jacob, Daniel and Richmoth. When disaster struck in June 1862, and Sarah’s clothing caught alight while she was cooking their soup over a fire, all four children were left helpless. Sarah was admitted to hospital where she suffered for some three months before finally dying, by which time the four children were desperate and destitute. They were initially taken in by a woman living with Thomas Wood in a house that had been a brothel adjacent to the Golden Gate, on the corner of Harrington and Collins Streets. However, the woman was sentenced to a term in the Cascades Female Factory, leaving all four in the sole care of Wood, who allegedly mis-treated them and misappropriated the small support that was paid by the Benevolent Society. Finally, on 22 September the three younger children were admitted to the Orphan School but Euphemia was deemed to be too old. Accustomed to caring for them, Euphemia looked for options to remain close by the New Town Orphan Schools so she could visit. Which is how, it is believed, she came to work at Cooleys Hote in Moonah, less than a mile north up the road from St Johns Park. It is further believed that she was befriended there by Charles Morris Cooley and his future wife Frances Jones who offered her accommodation with Frances’ parents, Frederick and Amelia Jones, at Perth and employment at the Star Hotel. Charles Cooley took over as licensee until the late 1860’s when Charles and Frances returned to Hobart. Emma continued to live with Jones family at Perth for many years and probably worked in one of Fred’s hotels. In mid 1871 she fell pregnant to George Jones, a labourer of Breadalbane. She gave her name as Emma Jones when registering the birth. It is not clear whether she adopted the name Jones from Fred and Amelia or from the father of her child, but George Jones is believed to be the son of convicts Thomas Jones and Sarah Venables and he was already married; his wife giving birth to their first child at around the same time. As Emma Agnes Jones she married Joseph Cocker at Longford on 23 Oct 1876. Witnesses were William John and Mary Taylor nee Boxhall. Jospeph and Emma raised Emma Louisa as their own and a further eight further children. Emma is believed to have been living in Perth with the Jones family when her third child, Frederick James, was born in 1881 which is about when Fred and Amelia moved to Victoria to join most of their married children. Frederick Jones became bankrupt in the 1870’s.